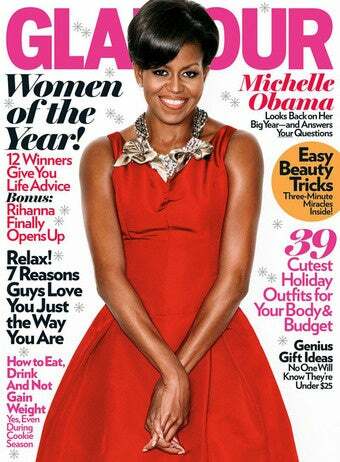 Michelle Obama, Rihanna, Serena Williams, Amy Poehler, and Maria Shriver are all fantastic choices for the cover of Glamour. Too bad they all have to share the December issue so Jessica Simpson can get her own month. You'd think Rihanna's first cover since her assault at the hands of Chris Brown or the First Lady would be big enough "gets" to warrant their own covers, but instead they're just two of five different versions of the December issue. Each features one of Glamour's "Women of the Year" and, while we're thrilled to see them recognized in a women's magazine, looking at their covers just highlights what's wrong with Glamour's real "women of the year" — the ones they choose to promote during the other 11 months of the year. The magazine's previous 2009 cover girls were: Britney Spears, Eva Longoria, Jennifer Connelly, Katie Holmes, Miley Cyrus, Renee Zellweger, Sandra Bullock, Taylor Swift, Jessica Simpson, Gwen Stefani, and Scarlett Johansson. That makes December even more special, since it's the only month that features a non-entertainer, a woman over 50, or a woman of color. When editor Cindi Leive pledged to include more plus-size models in Glamour last month, she also said the magazine would show, "A continued commitment to showing a wide range of body types — and, of course, racial diversity — in our pages..." To illustrate that the mag has always been committed to diversity, Leive said "we've put Queen Latifah on the cover twice." That's true, but she didn't mention that you have to go back two years to find a woman of color on the magazine's cover: Mariah Carey was on the November 2007 cover and Queen Latifah shared the September 2007 cover with Claire Danes and Mariska Hargitay. We'd like to take this month's covers as signs that the magazine will be making good on its promise to feature more women of color, but considering we needed a publicist to point out the plus-size model in this month's issue, we're skeptical. Cute's good, but cute only lasts for so long, and then it's, Who are you as a person? That's the advice I would give to women: Look at the heart. Look at the soul. Look at how the guy treats his mother and what he says about women. How he acts with children he doesn't know. And, more important, how does he treat you? When you're dating a man you should always feel good. You should never feel less than. You should never doubt yourself. You shouldn't be in a relationship with somebody who doesn't make you completely happy and make you feel whole. Domestic violence is a big secret... It's one of the things we [women] will hide, because it's embarrassing. My story was broadcast all over the world for people to see, and they have followed every step of my recovery. The positive thing that has come out of my situation is that people can learn from that. I want to give as much insight as I can to young women , because I feel like I represent a voice that isn't heard. Now I can help speak for those women. It's a little more meaty than most celebrity profiles, but unfortunately, Glamour ends by asking Rihanna about the really important question on everyone's mind: if she's already thinking about finding love again and having lots of babies.